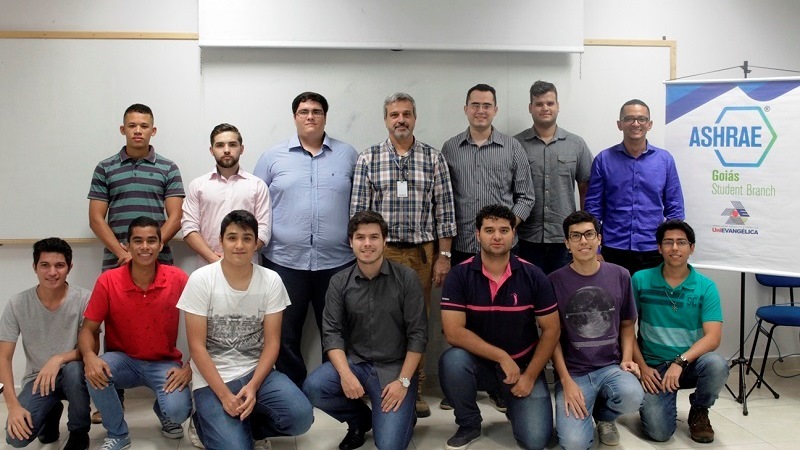 From May on, UniEVANGÉLICA will be the headquarters of the Student Branch of ASHRAE (American Society of Heating, Refrigerating and Air-Conditioning Engineers) in Goiás. ASHRAE is an international institution present in more than 130 countries and with over 50,000 members and brings together engineers, architects, technicians and undergraduate and graduate students in the area of ​​heating, ventilation, air conditioning and refrigeration. With headquarters in UniEVANGÉLICA, students will be able to organize seminars, lectures, displays and other local activities, involving other associated branches worldwide and private sector companies. The idea, initiated by Professors Roberto Capparelli and Gino Colheirinhas, of the Mechanical Engineering course, is to give students the possibility of articulating both locally and internationally. “They (the students) will have access to the main standards of refrigeration, air conditioning, energy efficiency, automation, air conditioning. It is a very good gain for students, experimenting hands-on and having opportunities for information exchange and networking”, said Professor Roberto. Besides that, the students are responsible for the entire structure of the branch that has a president, vice and treasurer, and the statute to be followed by all members, which also provides management and leadership skills to students. “Knowledge is what moves you, and everyone will get more knowledge. ASHRAE will provide many benefits”, says Victor Martins Batista, the president of ASHRAE Goiás. In addition to the organization of events and articulation between academia and the private sector, there is the possibility of partnerships with other branches of the world, the so-called “sisters”. And ASHRAE Goiás already has an agreement signed with University of California, Davis in the United States. With this, UniEVANGÉLICA opens a door of collaboration with the American university, aiming the exchange and the mobility of students. Professor Luiz Eduardo Krüger represented the Academic Coordinator of the of International Affairs Center (NAI), Prof. Marisa Espíndola, during the solemnity and made NAI available to the students. “An international association of students inside the campus of UniEVANGÉLICA shows that our student has already understood the importance of internationalization. NAI has the doors open to assist you in any matter”, he said.